Facebook has been rolling out their new “timeline” profile view for some time now, and the vast majority of Facebook users now have it turned on for their accounts, whether they want it or not. If you have the new timeline, then your phone number, photographs, and other personal information could be far more public than you think it is. 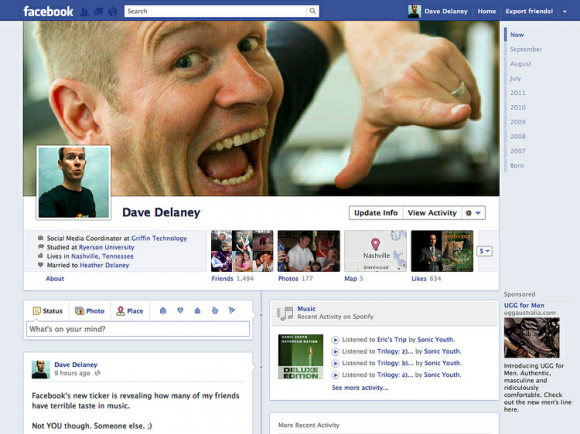 The new timeline makes all of your old Facebook updates public. If you don’t want people to be able to just scroll back through your old posts on a whim, you’ll have to go to your Privacy Settings page and change the Past Post Visibility Setting. This setting affects all your posts, so if you ever decide to make old posts visible, make sure you’re happy to show everything. There are chances that your mom might get to know about your bad habits and how much you’ve been drinking,smoking, partying and everything bad from at least the past 5 years or so. Your mobile uploads, wall photos, and profile pictures will all appear on your timeline. If you don’t want them to show, go back through your photo albums and set the visibility on the albums that you want hidden. When Timeline was made active, your privacy settings for search may have changed. If you don’t want people to be able to find you by random search, go to the How You Connect section of your privacy settings, and lock down the options there. You may also want to set your profile so that only your friends can view other people’s posts on your timeline, and only your friends can post to your timeline. Tagging photos on Facebook is sold as a benefit – you can tag other people, so it’s easy to find pictures of you with a friend, and you can tag locations, so all those photos of your holiday in Barbados are easy to find. However, tagging is a privacy nightmare. So there will be a lot of untagging work to do. When you location tag a photo, not only does that tell everyone where you are (so that annoying stalker of yours might turn up to the night club when you upload a picture with your mobile phone), you tell people where you are not, too. Do you really want to share a photo of your new flatscreen TV this week, then photos of your holiday in Barbados next week, when your home address is visible on your timeline? You may as well send an invitation letter to your local burglars. Tagging people can be problematic too. If your timeline is set up to display posts other people have made that have you tagged in them, then you could end up with some rather embarrassing pictures in your timeline. If you want control over what other people see, make sure that you have to manually approve pictures before they show in your timeline. As a courtesy to your friends, ask them first before you tag them in photos, and offer them help if they need to lock down their own timelines. This article was written by Ben Frisby on behalf of online marketing company Boom Online Marketing, an SEO agency. To see more about this online marketing company and SEO agency, visit their site.